The ITM held from 14-17 April in Istanbul is the most significant textile technology show in the region, bringing together industry manufacturers and visitors from all over the world. 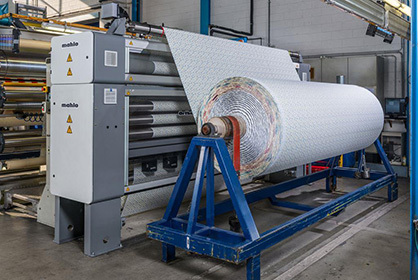 Mahlo participates with its partner Masters Limited, focusing of straightening and process control technologies for the blooming Turkish textile market. For textile finishers in Turkey and all over the world applies the same: In most applications, distorted fabric is one of the biggest problems to be solved. Distortions change the original structure of the product, reduce the quality and thus the prices to be achieved. They must be eliminated in order to preserve the full utilisation value of the product. Regardless of surface effects, this must be done fully automatically at today's commonly high product speeds. Not an easy task! “But for almost every demand, Mahlo has the perfect solution”, Areal Sales Manager Adnan Andac says. “The weft straightener Orthopac RVMC-15 is the epitome for straight goods.” Based on experience reaching back to the year 1945, the machine offers the latest technology for correcting distortions and optimising the processes all around the stenter. Optoelectronic scanning with oscillating lens and DSP (digital signal processor) is probably the most sensitive and versatile system on the market. Arranged on a carrier bridge, several of these sensors simultaneously detect the position of the weft thread at different points. The scanning system detects and analyses the regular basic structure of the weft threads, courses or rows of tufting. It automatically adapts the control system to a wide variety of textiles, even with the most complicated fabric structures. In order to correct the measured distortions, the textile user requires a sophisticated and universally applicable straightener with the highest possible customer benefit in terms of versatility and ease of use. “The new device generation 15 has been developed especially for the requirements of the market and has been optimised for almost all applications”, so Andac. The new generation of Mahlo straighteners, sensors and control loops is also ready for Industry 4.0 “and just a mouse click away from the individual data of existing machines”, Andac adds. If a customer uses suitable sensor technology and the appropriate networking, he can access the machine from everywhere, provided he has an Internet connection. But Mahlo is not only upfront with big machinery but also with small devices that have a huge value for textile production. Such as the Textometer DMB-15: It is a mobile handy device for measuring moisture on textile webs and bobbins on a wide variety of versions. It determines the moisture content of raw materials, semi-finished products and finished products precisely and quickly. A large selection of electrodes and accessories allows for a wide range of applications, for example hard-pressed fibre bales or hank yarns.